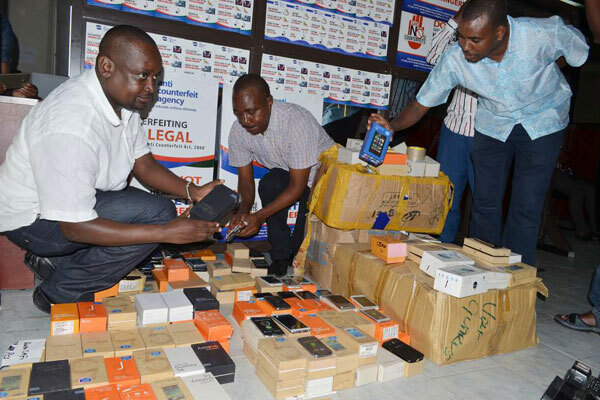 Anti-Counterfeit Agency officials display fake phones confiscated in Mombasa. A new report released by Anti-Counterfeits Agency (ACA) has shown that nearly three-quarters of Kenyans use counterfeit products that have been splashed 0n our markets countrywide. According to the government bureau, the most counterfeited goods in the market are mobile phones that represent about 51.8% and alcohol at 30.8%. DVD players come in third with a 26.4%t while bottled water follows at 24%. Other commonly counterfeited goods are lubricants, computer software, accessories and toners. Out of 70% Kenyans who use these fake products, 19 percent purchase them knowingly while 49.6 percent claim they buy the goods because they are cheap. ACA chair Flora Mutahi attributed counterfeiting to branding and trademark manipulation, mis-spelling of names and colouring. Mutahi disclosed that the government has seized counterfeit goods worth Ksh8.5 billion in the last six months. She stated the country loses an estimated Ksh200 billion annually due to trade in counterfeit products. “Kenya is indeed ahead of its counterparts in the fight against counterfeits but manned land borders open the country to illicit trade,” said Halake.